EDIT: Giveaway is officially over. Congratulations to Darlene Carbajal for submitting the randomly-chosen 1036th entry. After enduring early spring's arctic attitude, I am ready to rambunctiously roll around in May flowers! Even if the flowers are slow to bloom where you live, you can have bright bouquets right at your fingertips. Jamberry consultant, Kimberly of Kiss My Tips, is giving one lucky lady her choice of flower nail art. 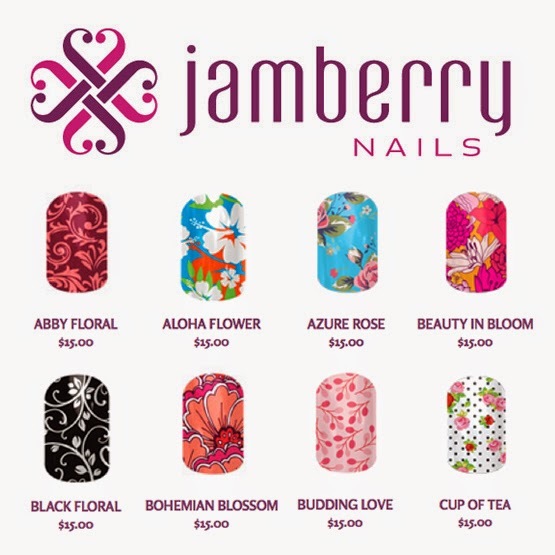 The winner may choose one free sheet from Jamberry's floral style category, which offers a few dozen designs in a range of colors. Each sheet provides enough nail wraps to complete at least two manicures or pedicures. If you hadn't noticed by my new Nails link in the navigation bar, I've been addicted to Jamberry Nails since Kimberly asked me to help host her Valentine's Day giveaway. Where as nail polish chips on me the first day, the nail wraps look almost as amazing after two weeks - and probably longer, but I always end up removing them because I'm so excited to switch to the next set. Can you believe they offer over 350 designs? If I had more hours in my day, I'd be tempted to become a consultant myself, considering Kimberly's excellent experience: "Thanks to Jamberry, I now have enviable salon-worthy nails for less than $5 a manicure and I get a paycheck from a business I love on top of it. 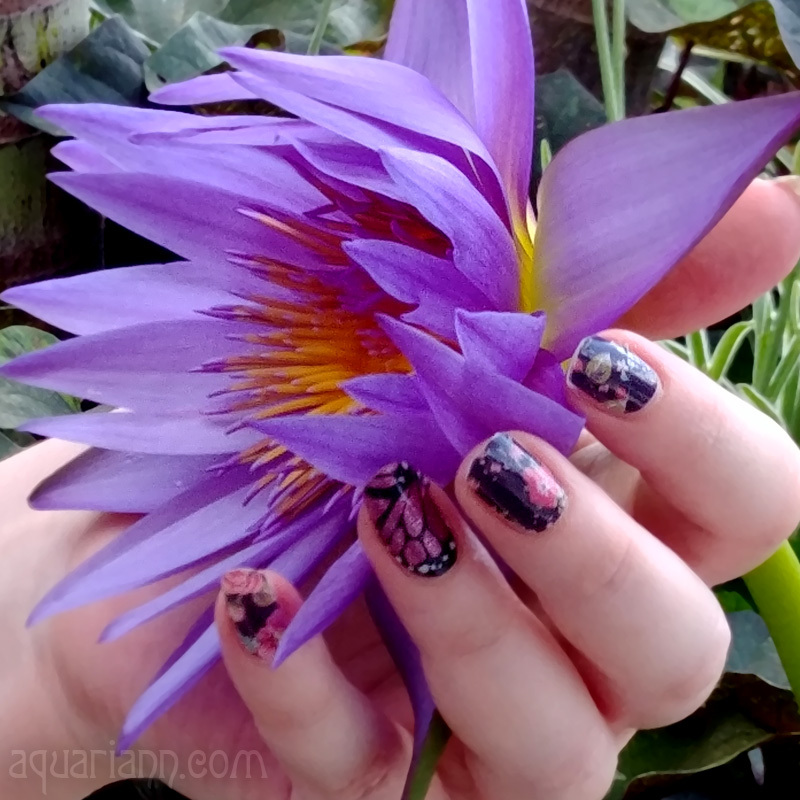 If you're new to the world of Jamberry Nails, I just know you'll love them as much as I do! If anyone would like to try a sample, please complete the drawing option to 'request a sample' and don't forget to provide your name and mailing address!" 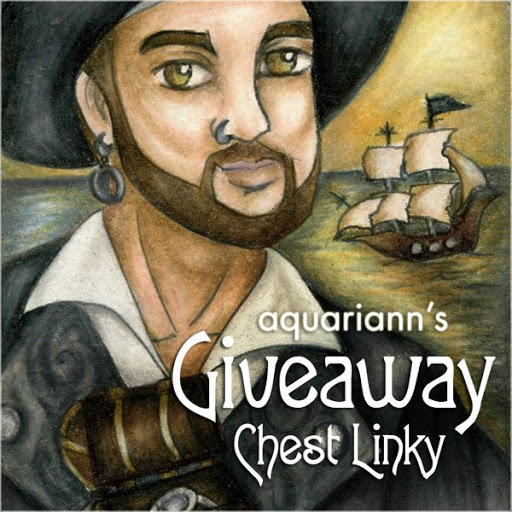 Use the Rafflecopter below to enter to win giveaway before 11:59pm EST on May 20, 2014. At this time, Jamberry wraps are only available for sale in the United States, Canada, Puerto Rico and Guam, thus you must be a resident in one of those countries to officially enter. I love nail art. I've put some pretty silly things on my nails in the past! I don't know which is the craziest, though! Hi! I'm not very good at nail art. lol I do very much enjoy nail polish, wraps, and giving myself manicures though. I guess the wildest thing was a groovy 60's type wrap I bought at Walgreen's. Thanks! not really wild ,but i remember experimenting with a back gloss varnish and putting glitter on the tips. i thought it looked really good. Is there a try before you buy option? Like a sample? I just saw there is. Yayyyyy! The wildest thing.....just tons of studs and caviar for a contest. Wildest thing was real, edible sprinkles with Elmer's glue...it didn't go very well! I'm boring. Never done anything wild! Love all of them! But the azure rose has to be be my favorite! I don't know how I could've missed this giveaway until now...The wildest thing I've ever put on my nails? Ummm...I'd say doing each nail differently - all 10. It took some time, but it was fun! My wife just simply adores the "Flutter By"! J' adore le " urban lights " la couleur est très belle. Once I put oil on my nails.